It’s a decision that every ski racer must come to terms with sooner or later in his or her career. Making the choice to step away from the sport you’ve dedicated much of your life to since the days of ripping around the mountain as a kid without a care in the world is never an easy one, especially when that decision comes due to factors largely beyond your control. After over a year of struggles with concussion symptoms, Alaska native and 2016 U.S. national giant slalom champion Kieffer Christianson announced his retirement from ski racing last month on social media. After his first documented concussion at age 14, the fiery and eccentric redhead enjoyed a meteoric rise through the national ranks until getting picked up by the U.S. Ski Team following his senior year at Burke Mountain Academy in Vermont. Following a concussion that sidelined him for six weeks during his second year on the national team, Christianson was able to avoid any significant head impacts from high-speed crashes or other incidents in the years since. However, repeated smaller, seemingly insignificant impacts to the head might have contributed to the 25-year-old’s symptoms that ultimately became too much to manage. The breaking point came last month after Christianson competed in a trail-running race at his home mountain of Alyeska, where he developed symptoms after a few minor slips and falls on his backside while out on the trails. When he realized that he could develop symptoms from impacts that weren’t even directly to his head, Christianson accepted the reality that his competitive ski career was over. Christianson made his World Cup debut at the 2013 season opener in Soelden, Austria, and was poised to make a name for himself on the world stage before a few seasons of inconsistent results led to him being cut from the national team for the 2016-2017 season. Christianson spent last season as an independent athlete with the hopes of finding his form and regaining a spot on the World Cup. His ultimate goal was to compete in the 2018 Olympic Winter Games in PyeongChang, South Korea. Christianson powers his way to a 2016 U.S. GS title in Sun Valley, Idaho. With the NFL facing mounting evidence that contact football can cause irreversible brain damage to players, concussions have been a hot topic in sports news in recent years, and for good reason. But for all of the time, money, and energy that has gone into researching head injuries, there is still much that remains unknown. After a suspected head injury, an athlete is subject to a battery of cognitive and physical tests to determine if a concussion occurred and whether or not the athlete is fit to return to competition. According to Christianson, he was by and large able to pass all of the standard concussion protocols, but he still felt off whenever he returned to any sort of grueling physical activity. As any athlete knows, admitting that you’re hurt is tough, but Christianson is thankful that he was surrounded by a group of close friends and coaches who were able to pick up on subtle changes to his behavior and encourage him to take time off when he needed. Self-reporting of head injuries is often the best way for an athlete to manage concussions and concussion-like symptoms. Looking towards the future, Christianson aims to complete his final two quarters of academic study at Dartmouth College while starting his coaching career at his home club in Alyeska. Thanks to Dartmouth’s quarter system, he’ll be able to split his time between New Hampshire and Alaska this coming season. By his own admission, Christianson says that he might not ever be totally OK with his career ending the way it did, which, given the circumstances, is more than understandable. Although his competitive days as a ski racer might be over, Christianson is already looking for opportunities to help other athletes better manage their concussion symptoms so they can avoid pitfalls similar to his. Not having the opportunity to end his career on his own terms will sting for years to come, but Christianson’s passion for skiing and his extraordinary personality have left an indelible mark on the U.S. ski racing community that will no doubt last. 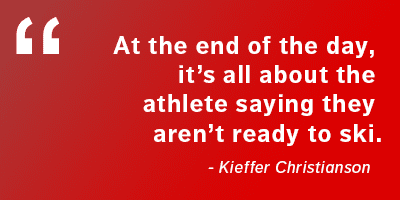 Best of luck on your next big adventure, Kieffer – we’ll be watching. China has big goals for getting millions of new people into alpine skiing.